Welcome to the brand new La Quinta Inn & Suites Kingman, centrally located in Kingman, Arizona. Our location is the perfect stopover in between Las Vegas, Nevada and Grand Canyon National Park. 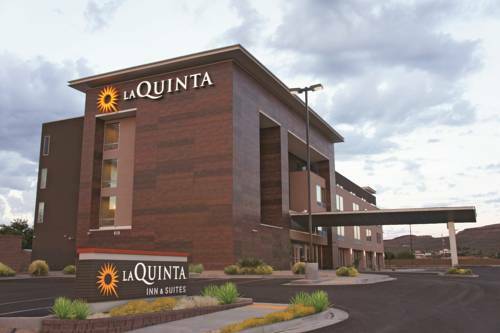 Located only blocks away from many Kingman businesses and just off of I-40 makes La Quinta Inn & Suites Kingman hotel the perfect place for business travelers. We are within walking distance to Kingman Regional Medical Center, Walmart Shopping Center, Ross Shopping Center and many of Kingman's best restaurants. Most everything Kingman has to offer is just minutes away! Grand Canyon Sky Walk is only 70 miles away. We want to make your stay with us be as pleasant and convenient as possible. Each of our guest rooms offers luxurious bedding, refrigerator, microwave, USB charging ports, coffee maker, hair dryer, and iron with ironing board, 42" flat-panel TVs with Direct TV channel lineup, and free high speed internet access. You can also relax by our sparkling indoor heated pool and spa, or enjoy a vigorous workout in our fitness center. Our guest laundry facility (small fee) and our business center are open 24 hours a day. And as always, pets are welcome. You can also stop by our Bright Side Market if you forget any of your essential amenities. Join us in the lobby for your free Bright Side Breakfast each morning of your stay. Take advantage of our Mohave Meeting room for all your meeting needs. We invite you to come and enjoy all that La Quinta Inn & Suites Kingman hotel has to offer.